This post A Recession Is Coming… And the Fed Can't Stop It appeared first on Daily Reckoning. Right now the Fed's target rate for fed funds, the so-called ?policy rate,? is 1.75%. How do you cut rates 3?5% when you're starting at 1.75%? You can't. Negative interest rates won't save the day. Negative rates have been tried in Japan, the eurozone, Sweden and Switzerland, and the evidence is that they don't work to stimulate the economy. The idea of negative rates is that they're an inducement to spend money; if you don't spend it, the bank takes it from your account ? the opposite of paying interest. Yet the evidence is that people save more with negative rates in order to meet their lifetime goals for retirement, health care, education, etc. What about more quantitative easing, or ?QE?? The Fed ended QE in late 2014 after three rounds known as QE1, QE2 and QE3 from 2008?2014. What about QE4 in a new recession? From 2008?2014, over the course of QE1, 2 and 3, the Fed grew its balance sheet from $800 billion to $4.4 trillion. That added $3.6 trillion of newly printed money, which the Fed used to purchase long-term assets in an effort to suppress interest rates across the yield curve. The plan was that lower long-term interest rates would force investors into riskier assets such as stocks and real estate. Ben Bernanke called this manipulation the ?portfolio channel? effect. These higher valuations for stocks and real estate would then create a ?wealth effect? that would encourage more spending. The higher valuations would also provide collateral for more borrowing. This combination of more spending and lending was supposed to get the economy on a sustainable path of higher growth. The problem now is that all of that leverage is still on the Fed's balance sheet. The $3.6 trillion of new money was never mopped up by the Fed; it's still there in the form of bank reserves. The Fed has begun a program of balance sheet normalization, but that program is not far along. The Fed's balance sheet is still over $4 trillion. In answering that question, it helps to bear in mind the Fed only has $40 billion in capital. With current assets of $4.4 billion, the Fed is leveraged 110-to-1. That's enough leverage to make Bernie Madoff blush. To be fair to the Fed, their leverage would be much lower if their gold certificates issued by the Treasury were marked to market. That's a story for another day, but it does say something significant about the future role of gold in the monetary system. There's an invisible confidence boundary where everyday Americans will suddenly lose confidence in Fed liabilities (aka ?dollars?) in a hypersynchronous phase transition. No one knows exactly where the boundary is, but no one wants to find out the hard way. It's out there, possibly at the $5 trillion level. The Fed seems to agree (although they won't say so). Otherwise they would not be trying to reduce their balance sheet today. So if a recession hit tomorrow, the Fed would not be able to save the day with rate cuts, because they'd hit the zero bound before they could cut enough to make a difference. They would not be able to save the day with QE4, because they're already overleveraged. All they can do is raise rates (slowly), reduce the balance sheet (slowly) and pray that a recession does not hit before they get things back to ?normal,? probably around 2021. What are the odds of the Fed being able to pull this off before the next recession hits? The current expansion is shown with the orange bar. It started in June 2009 and has continued until today. 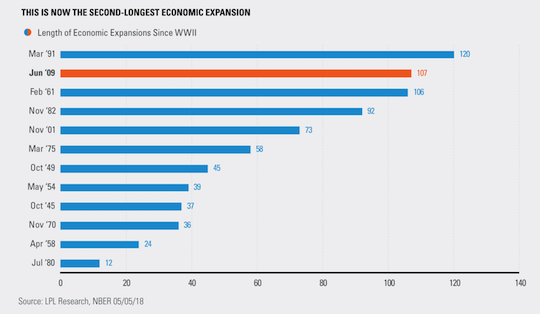 It is the second-longest expansion since 1945, currently at 107 months. It is longer than the Reagan-Bush expansion of 1982?90. It is longer than the Kennedy-Johnson expansion of 1961?69. It's longer than any expansion except the Clinton-Gingrich expansion of 1991?2001. Just on a statistical basis, the odds of this expansion turning to recession before the end of 2020 are extremely high. In short, there's a very high probability that the U.S. economy will go into recession before the Fed is prepared to get us out of it. That means once the recession starts, the U.S. may stay in the situation for decades, which is exactly what happened to Japan beginning in 1990. By the way, Japan's most recent GDP report for the first quarter of 2018 showed negative growth. Japan has had three ?lost decades.? The U.S. is just finishing its first lost decade and may have two more to go. The situation is even worse than this dire forecast suggests. The reason is that by preparing to fight the next recession, the Fed may actually cause the recession they're preparing to cure. It's like trying to run a marathon while being chased by a hungry bear. The Fed needs to raise rates and reduce their balance sheet in order to have enough policy leeway to fight a recession. If they move too quickly, they'll cause a recession. If they move too slowly, they'll run out of time and get eaten by the bear. A recession is coming, the Fed is unprepared and it's extremely unlikely the Fed will be prepared in time. The only other recommendation is to do what the Fed is doing? pray. The post A Recession Is Coming… And the Fed Can't Stop It appeared first on Daily Reckoning.